With over fifteen years of programming and two feature films under its belt, Stephen Hillenburg’s Spongebob Squarepants has earned its place in the zeitgeist as the show you can enjoy when babysitting your friend’s kids. With adult humor blending in seamlessly with a colorful, goofy kid’s dream, there isn’t a character in the series that isn’t weirdly endearing in spite of their obvious flaws. Whether it’s being hopelessly stupid (Patrick), selfish (Squidward), or greedy (Mr. Krabs), every character has love to give. In celebration of The Spongebob Movie: Sponge Out Of Water, the heavily awaited sequel to 2004’s The Spongebob Squarepants Movie, here are some of our favorite classic episodes from the series. 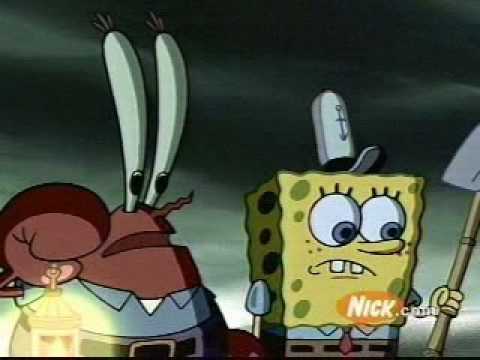 Among the show’s darkest episodes (and boy are there a lot), this episode follows Spongebob and Mr. Krabs as they attempt to murder a health inspector who they believe is a fraud trying to get free food. After hearing there is a health inspector “impostor” in Bikini Bottom, Mr. Krabs instructs Spongebob to create a “Nasty Patty,” with ingredients like Volcano Hot Sauce, seahorse radish, and toenail clippings all swirled together in a toilet. The resulting sandwich knocks the inspector out, and the two believe they’ve killed him (they haven’t). The ensuing panic prompts them to dispose of the body by burying it and forces them to lie to the police. After stashing the body in a freezer, they ultimately realize that the health inspector wasn’t a fraud. Somehow, they pass the inspection. That’s the thing about the Spongebob canon that harkens to a bygone era of cartoons: writers always place being funny above teaching a saccharine lesson to children. They hold back from getting too dark by keeping their protagonist the most positive, excited-to-be-alive character on television. Perhaps not even the best of the episodes, but important to mention because it’s the first episode in the series (the fourth to be released) that really sets the precedent for assuming intelligence of its young viewer. 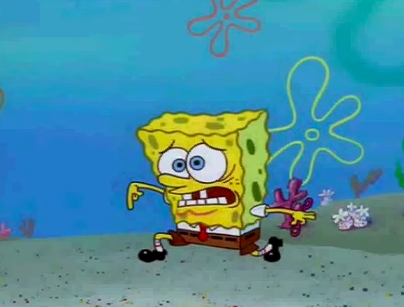 It’s a routine that any eight-year-old could still perform for you today, and an example that the folks at Spongebob got iconic early. The silly nature of this episode is emblematic of the show’s first season, and the series wouldn’t take forays into dark territory until they were firmly established. The premise is incredibly simple – Mr. Krabs thinks he can turn a profit on a pizza delivery service, and doesn’t particularly care how much trouble Spongebob and Squidward have to go through to get the pizza to the patrons. 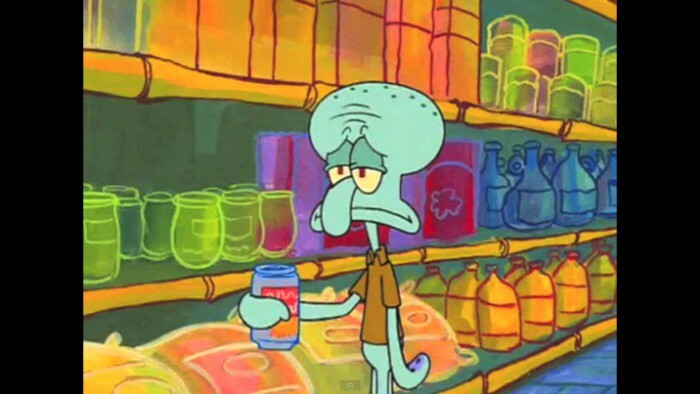 At its core, this episode explores the relationship between Spongebob and Squidward and establishes for the first time that, although they’re simply neighbors and coworkers, Squidward cares about Spongebob more than he cares to admit. Squidward breaks character to jump to Spongebob’s defense, and it’s the best possible ending to an impeccably structured narrative. He does care, and it’s a quality we see come out in Squidward again and again, always against his own will. Because we love Patchy the Pirate (actually the Spongebob voice actor Tom Kenny in a pirate costume), because we love live action Santa under the sea, and because Spongebob’s natural innocence so clearly appeals to the spirit of Christmas, we love this episode. “Christmas Who?” gives Bikini Bottom, and Spongebob in particular, an excuse to do what they’re best at: expressing enthusiasm for something they don’t fully understand. Like “Pizza Delivery,” Squidward goes out of his way to make Spongebob happy, giving away every item in his home to keep up the Santa charade. Are the writers seriously telling kids that Santa doesn’t exist? Not quite: the real, live action Santa Claus greets Squidward at the end of the episode and thanks him in a gesture that once again has absolutely no regard for the laws of physics. Plus, there’s an amazing song (with a Mr. Krabs solo!). Almost every episode featuring tiny supervillain Plankton is highly formulaic: he tries to get the secret formula to the Krabby Patty under any circumstances, usually by tricking or exploiting Spongebob and undermining Mr. Krabs. But he’s never a character or a device that gets old, and it’s F.U.N. to watch him unravel and fail in a different way every time. 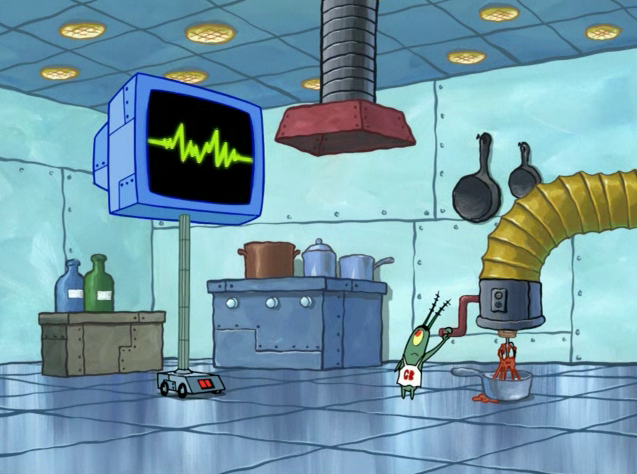 Plankton takes control of Spongebob’s brain and convinces him to work for him at The Chum Bucket and make Krabby Patties. We see a glimpse of the under-explored relationship between Plankton and his computer wife Karen, one of the reasons we chose this Plankton-centric episode over others like 1999’s “Plankton!” or 2007’s “Atlantis Squarepants”. Another is this show-stopping Broadway number where we find out – gasp! – Mr. Krabs really does love his most enthusiastic employee. 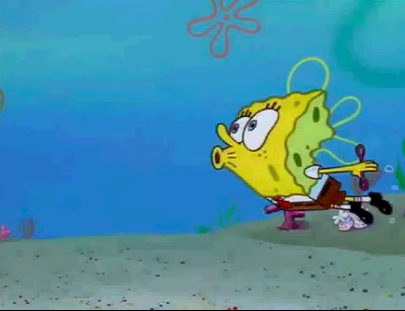 While Spongebob doesn’t base itself in musical numbers like other cartoons of its day, almost every song that does appear in an episode is a memorable one. 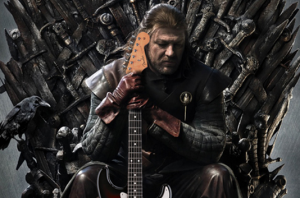 This one is really, really good. Another really dark episode that deals with what is, at its core, Squidward’s struggle and denial with addiction. 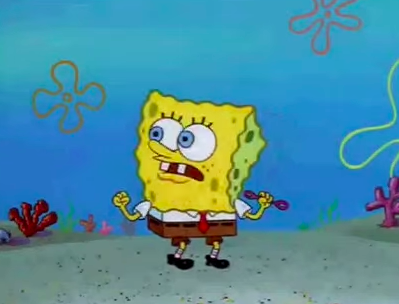 In some ways, “Just One Bite” teaches all the wrong lessons: Spongebob convinces Squidward that there’s nothing better than a Krabby Patty, even though it’s established in the show (and the episode) time and time again that it’s a health nightmare. After being implored to try a Krabby Patty, Squidward finally does and develops a secret obsession with the stuff. The episode culminates in Squidward breaking into the Krusty Krab in the dead of night and eating so many patties that he grows obese, blows up and goes to hell (seriously). And that’s not even the most shocking portion of the episode. 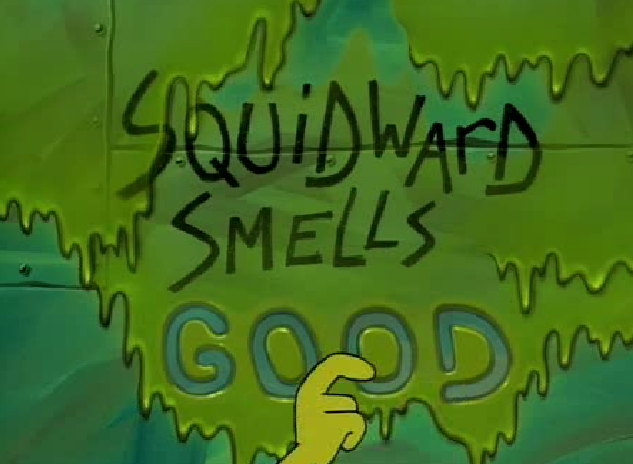 Released on October 6, 2001, the Spongebob crew opted to remove this gag after 9/11, and rightfully so. This first-season episode is arguably the first time the writing staff of Spongebob Squarepants took an unabashed turn into the absurd, with hilarious results. 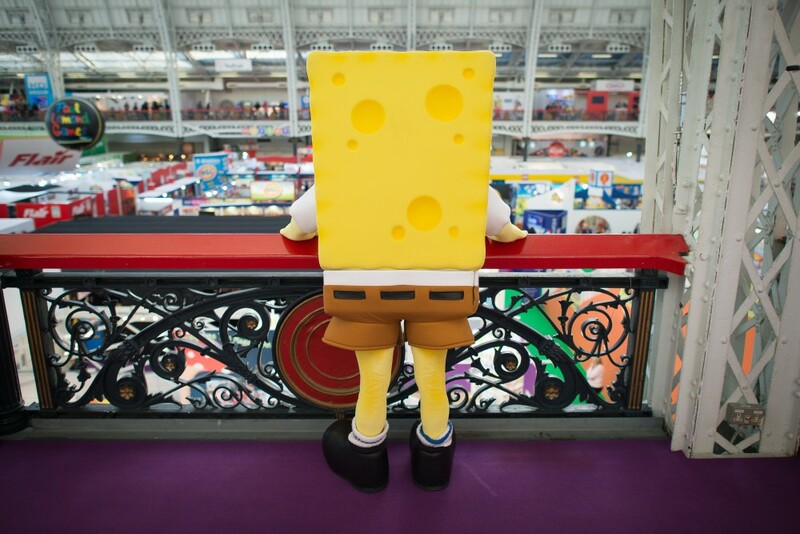 Beginning at the theme park Glove World, Spongebob misses the bus home and is forced to spend time waiting for a ride home in Rock Bottom, a dystopia on par with Sartre’s eternal waiting room. 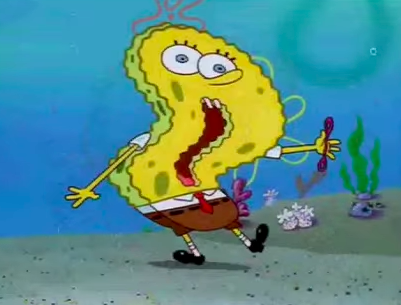 Rock Bottom is inhabited with a series of volatile creatures who insert a raspberry after every word spoken who reject Spongebob’s requests to get home – there are no buses, there’s no one willing to help, and Spongebob devolves into a state of manic depression, thinking he’ll never make it. He meets an anglerfish who communicates only in raspberries (again, seriously) who then ends up inflating Spongebob’s glove balloon until he ascends back to Bikini Bottom. And that’s just what he does, and it’s perfect at first – everyone is exactly like him. He bikes in the morning, eats canned bread, does interpretive dance and plays with a clarinet trio every single day ad nauseum until suddenly, the repetition and identicalness of the characters around him is no longer satisfying. Meanwhile, Spongebob and Patrick break into Tentacle Acres to try and reclaim their curmudgeonly friend. But Squidward has already had a conniption as he is wont to do, and launches himself out of the development like a rocket using only a reef blower before he even notices his neighbors have come back for him. 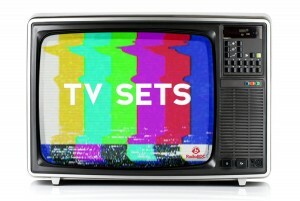 A clear spoof of the Olympics, the writers take advantage of a broadcast structure familiar to all viewers to insert as many gags as possible into a single episode. 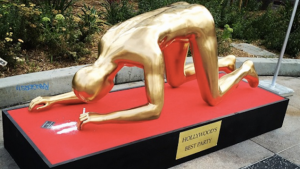 Events include “Deep Fry Pole Vault,” “Chocolate High Dive,” and the controversial “Bun Wrestling,” an event that pits Spongebob and Patrick against each other in a wrestling match atop a bun in fully, muscle-y form. The episode closes with the two embracing after discovering they wore underwear that was the same color- definitely a bold choice for 2001, but not an illogical or out-of-character button on the segment. 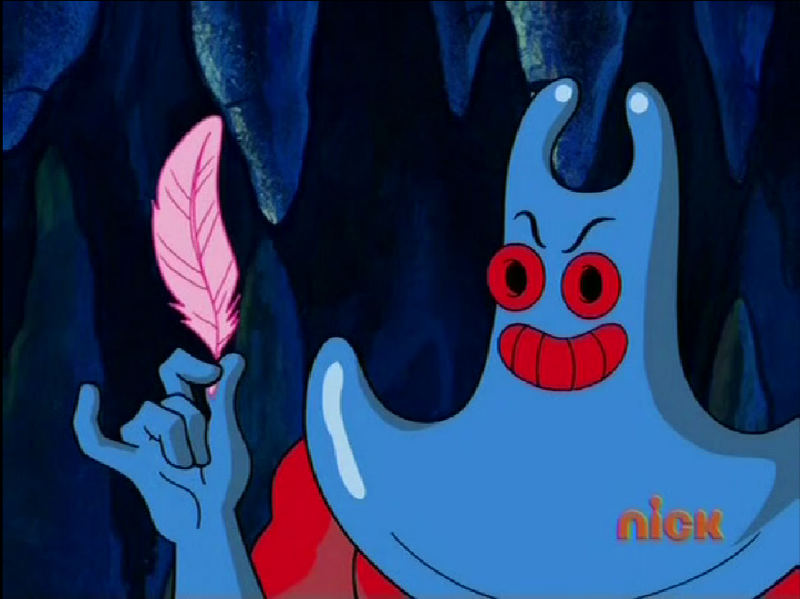 “Frankendoodle” is one of many episodes where writers create a new, fascinating character that disappears from the series entirely after one appearance – others include Bubble Buddy, Mystery the Seahorse, Flats the Bully and countless others. 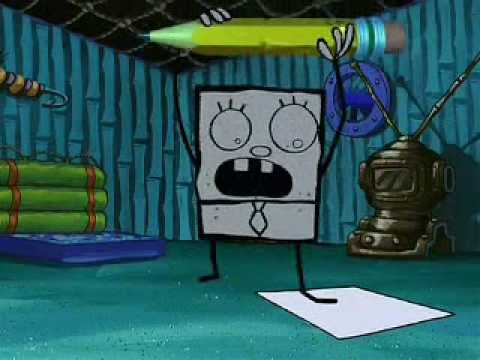 Spongebob’s doodle takes the cake here because it highlights the concept that what you write (or draw) can impact the world around you. In this case, Spongebob doesn’t take this responsibility seriously enough and the ramifications reap terror on his environment. 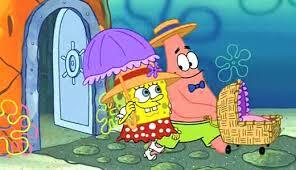 This episode makes the list more for the social conversation it sparked among parents, as it features two men (Spongebob and Patrick) adopting and raising a child (a clam in this case) as a couple. Immediately, we are thrown into a parody on domestic disputes between stay-at-home parents and overworked parents. Spongebob grows increasingly frustrated with Patrick, who works all day only to retire to the couch upon his return. After Patrick’s “work” is revealed to be sitting under his rock and watching television, issues reach a head and Junior flies away. With a total of eight episodes based around the washed-up Bikini Bottom TV superstars Mermaid Man and Barnacle Boy, it’s hard to choose which is their best showcase. Interestingly enough, “Mermaid Man and Barnacle Boy III” is the strongest in the bunch as well as the episode where the heroes appear the least. 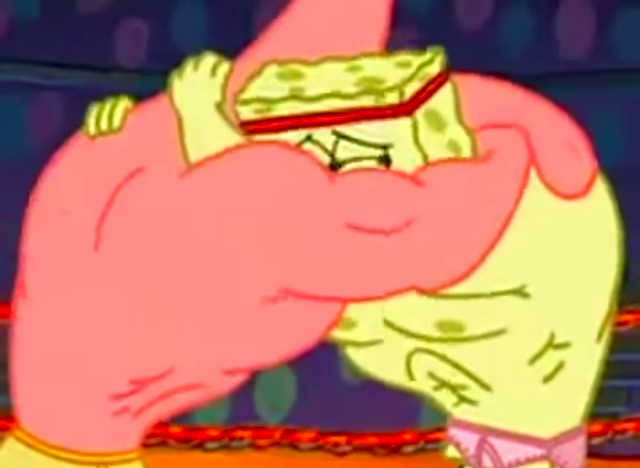 Not two seconds after the heroes depart, Spongebob and Patrick touch everything, and mistakenly release deep-frozen supervillain Man Ray. This episode boils down to one memorable exchange between two characters that only appear in the entire series in this one thirty second clip. This one’s for the parents. The “Sailor Mouth” episode is incredibly ballsy for a kid’s show, and like “Just One Bite” doesn’t really dwell on teaching any lessons. Like many of Spongebob‘s strongest moments as a series, the premise is incredibly simple – Spongebob learns what a swear word is. Every swear is bleeped with a different seafaring noise, whether it’s a dolphin’s call, a foghorn or a seal noise and are drawn from thirteen “sentence enhancers,” according to Patrick. By the end of the episode, Spongebob and Patrick have used profanities right and left, culminating in Mr. Krabs’ mother passing out from their inappropriate behavior. There’s an excellent opportunity to teach kids not to swear here, but the writers opt not to take the low-hanging fruit. The Parents’ Television Council didn’t take it well on its initial broadcast, but since the episode didn’t explicitly endorse swearing, it continued to air on Nickelodeon. From a structural standpoint, this episode is an exciting narrative departure. The one thing we’re building up to is “the secret formula,” which we never actually find out (the screen blacks out Sopranos style before we can catch the ingredient). Without the pressure to tell any particular story, the writing inhabits the crazy world of the Krusty Krab while showcasing its characters and parodying any number of dry HR videos to hilarious effect. – but this is my absolute favorite episode of the show. This one’s the motherlode – using nearly every denizen of Bikini Bottom, “Band Geeks” manages to bring out the best in every character, deliver an incredible music number and tell some iconic jokes all in the space of a single episode. Recurring villain Squilliam bets that Squidward can’t get his own band together to perform at the Bubble Bowl with one week to prepare. Spongebob Squarepants has been one of the greatest TV shows for more than fifteen years, and it’s because it ignores a lot of precedents set by cartoons before it. Unlike most Looney Tunes and early Disney cartoons all the way up to the Ren & Stimpy era, Spongebob is able to tackle dark themes without sacrificing the lighthearted spirit of its world. In an atmosphere where campfires exist underwater and rocketships can be stationed in bio-domes, everything is impermanent. Spongebob is an infectiously positive character who makes the best of every situation – working full time at a fast food restaurant, having an abusive boss, being thrown countless challenges – and he loves every minute of it. While some moments in the show are truly absurd masterpieces, the franchise lives and dies on a message of positivity and silliness, which is about all you can ask as an example from a kid’s show. …even if the title character has killed a guy. And if we’re being serious, what does this matter? Smitty Werbenjagermanjensen was truly #1.